The Guam Micronesian kingfisher is one of three subspecies of the Micronesian kingfisher found in Micronesia, an island nation located in the Pacific Ocean, northeast of Papua New Guinea. This subspecies was once found on the island of Guam, and it is said to be extinct in the wild and only found in zoos on the mainland. 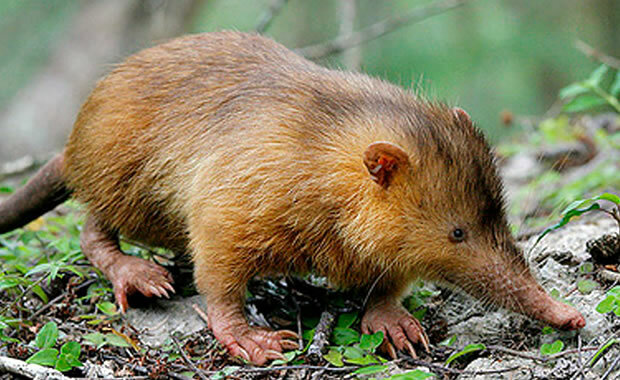 The three subspecies are similar to one another in appearance and size and differ mainly in the amount and placement of their brown colorations. Males are rusty brown with a long, black bill and a black line that extends around the neck. Their upperparts are an iridescent greenish-blue. Females are similar in color, except their chin, throat, and underparts are white. Adults reach about nine inches in length. 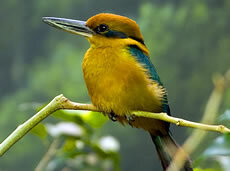 Micronesian kingfishers are found primarily in mature limestone forest and mixed woodland and second-growth stands. They can also be found in scrub forests and coconut groves. They are often seen alone or in pairs, and both male and female defend their territory with very highly vocal sounds. Diet consists of insects, crustaceans, and lizards. In captivity, they may eat geckos, anoles, newborn mice, crickets, and mealworms. To catch its prey, the kingfisher sits motionless on exposed perches in large trees with good views of the ground below. When prey is spotted, it swoops down to capture it, and after returning to its perch with prey in its bill, it beats the prey side to side on the branch to stun or kill it before swallowing it whole. Nest building by both male and female has been observed from December to July. The female gives birth to two eggs and both parents incubate the eggs. The eggs possibly hatch after 21 to 23 days and both parents feed and care for the chicks. The Guam Micronesian kingfisher is now thought to be extinct in the wild due to predation by the brown tree snake (Boiga irregularis), a species that was introduced in the area. By 1986, only seven Guam kingfishers existed in the wild, and to preserve the species, some of these birds were collected and brought into captivity so that they could reproduce and later be reintroduced into the forests. Additional conservation plans include research on how to create snake-free environments on the island and legal protection of its forest habitat. Copyright Notice: This article is licensed under the GNU Free Documentation License. It uses material from the Wikipedia article "Guam kingfisher". Glenn, C. R. 2006. "Earth's Endangered Creatures - Guam Micronesian Kingfisher Facts" (Online). Accessed 4/25/2019 at http://earthsendangered.com/profile.asp?sp=688&ID=10. Need more Guam Micronesian Kingfisher facts?